I love these little cooking videos on speed. You know the ones I mean? The hands and ingredients fly together so quickly the dish makes itself! Peach crumble cobbler in three easy steps, boom, boom, boom. Cheese and egg bake, just layer in fast forward and throw in oven. Literally. Avocado, chili and lime dip, zip and rip in blender with sea salt. Little containers of sea salt, which, of course, everyone has lying around, appear magically in these revved-up recipes. Are these videos inspiring? Yes, they inspire me to THINK about bringing something fancy to my next potluck or to invite friends for dessert or appetizers … or to venture beyond my basic meals. Not to actually DO, however. What I want is that little hopped-up chef to pop right out of my computer onto my kitchen counter and get to work! On demand. Like a single-serve coffee brewer, only with more ingredients. And many, many ideas for delicious, healthy, fun meals. We already have the Roomba vacuum cleaner clanking around and soon we will have self-driving cars (a dream or a nightmare, I can’t decide), so why not mechanical chefs? They could be as varied as our budgets and dining rooms allow. For party givers, cooking machines as large as a pantry. And stocked like a pantry too, with a big variety of menus and goodies for all sorts of events, from drop-in cocktail parties to sit-down five-course meals. And why not include cocktails, wines and beers to accommodate a variety of tastes and entertainment? For families, a do-not-let-up diner, breakfast and lunch maker programmed to keep everyone healthy and away from the grocery store for at least a week, maybe two! Special program corners for fresh baby food and tea and coffee. For singles, no sad-sack burritos or wasted leftovers. A compact robot friend to weigh out just the right amount of whatever appeals to us at the moment. Hey, one advantage of being single is that we can eat strange foods at strange times without reporting to anyone. For health fanatics who are into juicing, a cute little citrus-colored robot replacing the blender and shooting out vitamin pills. Whipping up low-fat guacamole and hummus and spitting out the carrot and celery sticks. Finally, let us not forget our animal friends, dogs, cats, birds, fish, reptiles and so on. Since I have three cats, part of my resident robotic chef would cater to them. It would know when they were in the mood for chicken pate and NOT flaky tuna bits, for example. No more stare-downs trying to outwit their stubbornness while the unwanted food of the day lumps into smelly cement. So, move over Cuisinart and NutriBullet, I am making room. 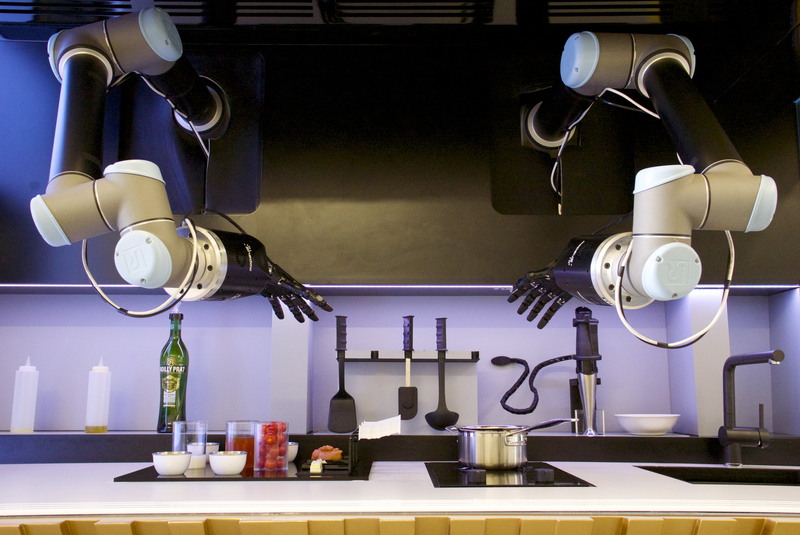 In June of 2015, Newsweek ran an article on the kitchen of the future: “Good to the Last Byte: Food Gets Digitized.” It pictured two big robot arms hovering over a stove. Seems creepy to me. Who wants to embrace two disembodied arms? No, I’m putting in my order for the whole little chef. Hopefully this mechanical chef also does dishes and fits compactly on a shelf when not in use. Oh and comes in various colors to match your kitchen. Previous Previous post: What’s Luck Got To Do with It?